As for Bie, she simply adores antiques. It is a way of living, a passion for her, which she loves to share with her customers who easily become friends. Having been an antique dealer for 22 years Bie has extensive knowledge of what she sells. She can explain the difference between boxwood, lignum vitae and bone versus ivory, all the while extolling the artistic merits of the artisan who carved the piece. She will lovingly explain how she chose an item. Why the particular object is superior to the five others she passed on purchasing. She will explain how her pieces are lovingly restored in her own workshop. How everything that comes from her shop is in perfect condition and ready to display in another local. If you become a habitual visitor of her atelier and also visit the top antiques fairs in Europe and America, you will notice many pieces have come through her shop. 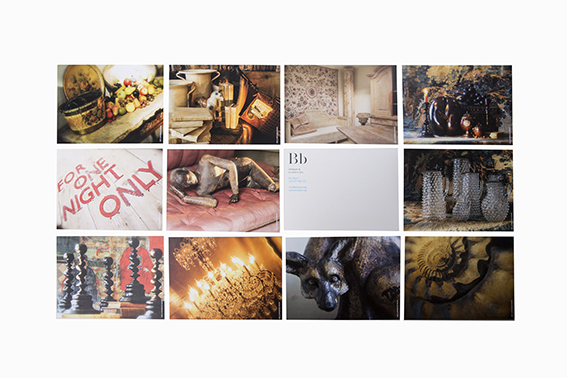 You will notice how Bie Baert has influenced the antiques business through her warmth and unerring eye. She is the secret source of Belgium. Bie vroeg studio 47 een eyecatcher als uitnodiging voor haar open deur dagen. Er werd een ontwerp gemaakt bestaande uit een reeks kaarten met telkens een andere achtergrond, deze kaart werd in een omslag omsloten voorzien met lasercutting. Het geheel werd verzonden in een feestelijke enveloppe. Lasercutting door Asuvorm op Keycolour (Arjowiggins creative papers), kaarten gedrukt op postkaart karton, enveloppe uit de Curious collectie (Arjowiggins creative papers). Drukwerk verzorgd door drukkerij s’ Print in Brussel.